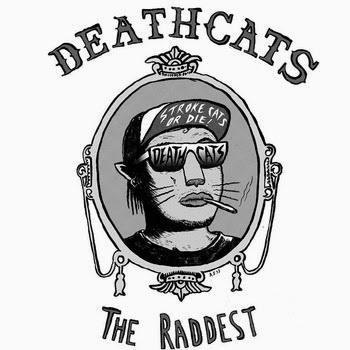 Deathcats are a trio of surf-punk enthusiasts from Scotland, and this is their new EP The Raddest. These guys spent the majority of 2013 touring with the likes of Mazes, Splashh and Hooded Fang, and with their contagious sound of sunshine-soaked punk rock delivering all the accessible qualities of surf-rock, we think these guys will be ones to watch for 2014. Lead single I Wish It Was Summer kicks off the EP with a scrappy guitar riff and nice, jangly melodies that bares some sort of vague relation to The Beach Boys. The lo-fi production pretty much makes the music of Deathcats sound like the tweaked out older brother of The Beach Boys, which is still good nonetheless. This track like all surf-rock songs is very catchy and contains all kinds of hooks that’ll stick in the listener’s mind forever; a good start to the EP. Surfing In My Head sees Deathcats perform more of a love song towards another human rather than another season. It’s drawn out riffs and backing vocals allow the track to head more into ballad territory, and the band do a great job of retaining their scrappy, punk sound present. The chorus is arguably more accessible than the lead single, though they’re both top notch. Cowabunga Surf Jam is possibly the most surf-rock song we’ve ever heard. The bright, jangly guitars spring sweet melodies, the vocals are at their most twangy, and the lo-fi feel gives it a really good, summer atmosphere. The Raddest EP certainly makes us wish it was summer again. Deathcats have got themselves a very good EP here, with three songs (and Trash Talk…whatever that’s meant to be) that all deliver all the good things that make surf-rock so easily enjoyable. The band’s incorporation of punk rock allows them to go harder and faster than other surf rock favourites with their material, and while this EP flies past at just over 10 minutes, it definitely leaves a lasting impression. We cannot wait to check out the band’s debut LP which could be released sometime this year, but now, we’re more than content waiting in this sunny utopia they’ve painted for us.